"What are Raphael's Madonnas but the shadow of a mother's love, fixed in permanent outline forever?" Raphael is considered one of the most important and brilliant artists of the Italian Renaissance. He painted and designed many astonishing pieces of work inside the Vatican and was a master at using depth and perspective, along light and shadow - the cornerstones of modern day art. Throughout his short life, Raphael would make some of the most awe-inspiring, beautiful and influential works of the Italian Renaissance. 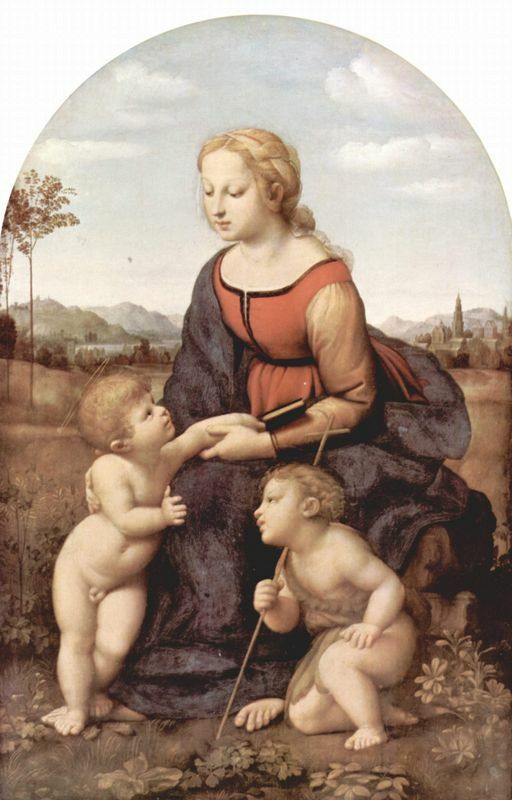 Raffaello Sanzio da Urbino, widely known today as Raphael, was born on either 28th of March or 6th of April (depending on which date Good Friday fell) in Urbino, 1483, to parents Giovanni Santi and Magia di Battista Ciarla. His mother died in 1491, while his father Giovanni, who was an artist of moderate ability, introduced young Raphael to the cultural, philosophical and artistic values of court life. His father died three years after his mother in 1494. Urbino, itself a bastion of cultural learning during the 16th century, proved the basis for all of Raphael's subsequent learning. He proved an exceptional talent from an early age and evidence suggests he was being commissioned for artworks in Perugia by the age of 12, and was regarded as a master by 1500. His mastery is further verified by the nature of the commissions he received, notably to paint the Coronation of the Virgin for the Oddi Chapel in the church of San Francesco, Perugia. 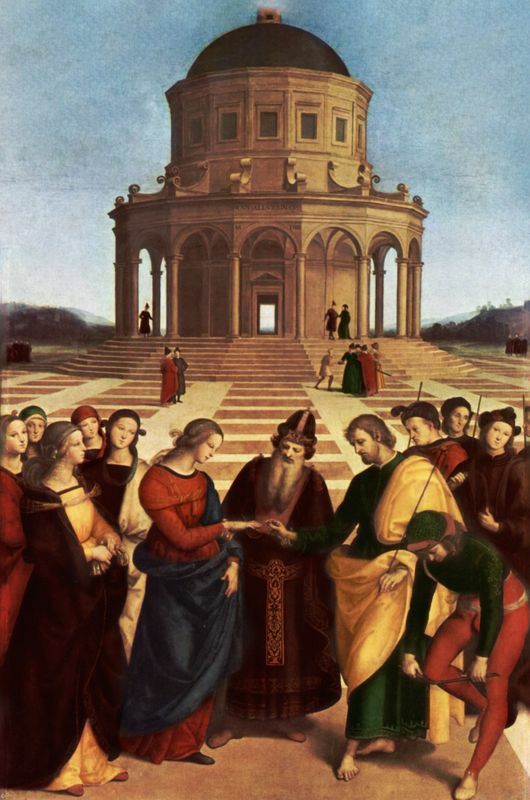 During this time Raphael was under the tutelage of the Umbrian master, Pietro Perugino, and a member of his workshop. It was here that he displayed his talent for absorbing the teachings and style of the masters (he would later replicate the styles of Leonardo and Michelangelo) and adapted them to his own work. 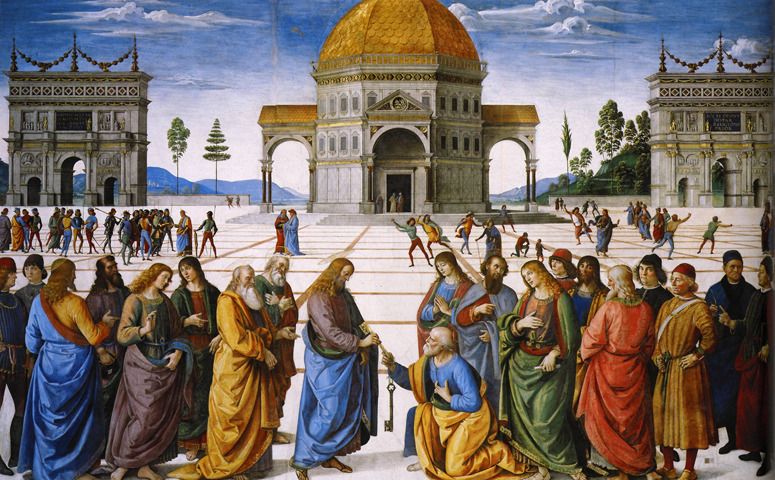 For example, Perugino's Christ Handing the Keys to Saint Peter inspired Raphael's first major work Marriage of the Virgin. And the three small paintings after this work (Vision of a Knight, Three Graces, St. Michael) are masterful examples of narrative painting. These pieces also display complete control of his own style and therefore the desire for artistic inspiration beyond Perugia. According to Vasari, Raphael was drawn to Florence by the accounts of the impressive works that Leonardo da Vinci and Michelangelo were painting in that city. In Florence (he had definitely arrived there by 1504) Raphael spent his time studying the works of Leonardo, Michelangelo and Fra Bartolomeo, and also the works of Masaccio, a pioneer of naturalism who marked the departure of the early Renaissance from the Gothic. As for his own output during this period, Raphael executed a series of brilliant Madonna paintings in Florence between 1505 and 1507, La Belle Jardiniere being just one example. These works are all marked by the influence of Leonardo da Vinci, who had been making great innovations in painting since the 1480s. 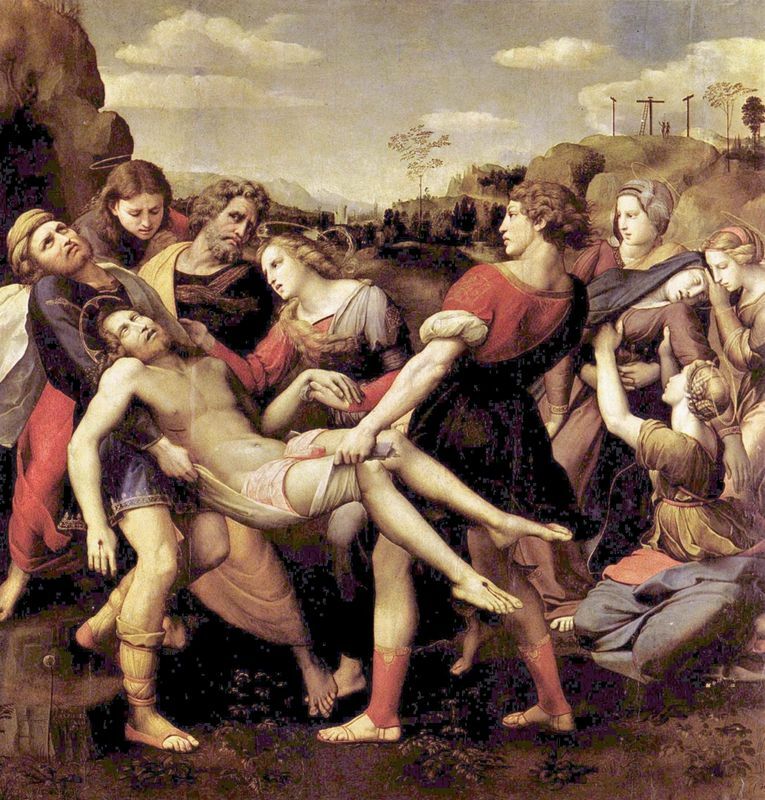 Following on from Leonardo's influence, in 1507 Raphael used a commission to paint the Deposition of Christ, to deliberately learn from Michelangelo the expressive possibilities of human anatomy. Following this work, Raphael was called to Rome in 1508 by Pope Julius II at the suggestion of the architect and Raphael's distant relative, Donato Bramante. Although a lesser-known artist in Rome, Raphael made a deep impression on the volatile Julius and his stature as a master and great artist was to grow for the rest of his life. Raphael spent his time in R&ogravzzz;me feverishly completing several successive masterpieces in the Vatican papal apartments. As a testament to his prodigy, most of the numerous frescoes he decorated during this period were done so entirely by himself, whilst others were designed by Raphael but executed by his many assistants and pupils. The decoration of the four main walls Stanza della Segnatura, carried out between 1509 and 1510 was perhaps Raphael's greatest work. The theme was the historical justification of the power of the Roman Catholic Church through neo-Platonic philosophy. 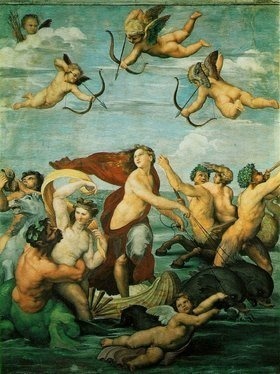 In 1511, Raphael painted a more secular subject, The Triumph of Galatea, which is perhaps the High Renaissance's most successful evocation of the living spirit of classical antiquity. His decoration of the papal apartments continued after the death of Julius II in 1513, under the pontificate of Leo X, until 1517. Besides his other works, Raphael became the most important portraitist in Rome during the first two decades of the 16th century. 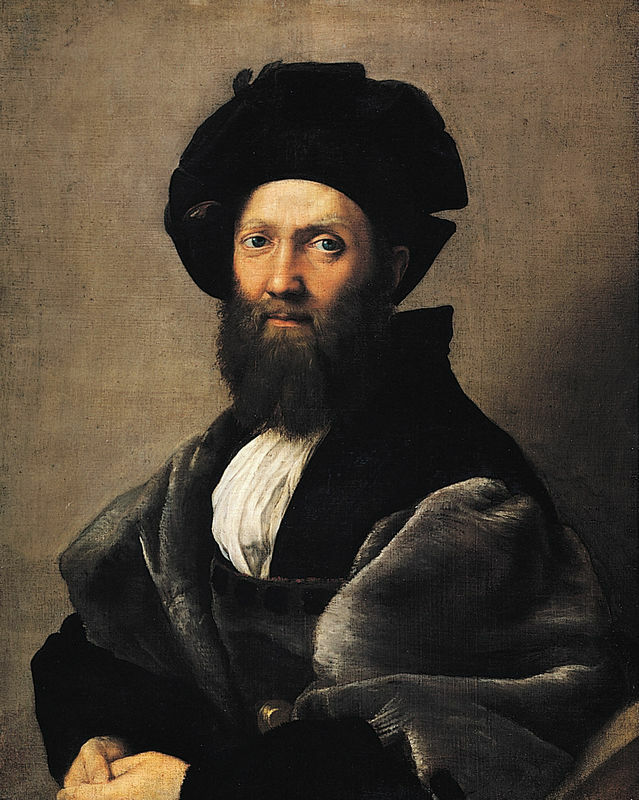 His finest work in the genre is perhaps the Portrait of Baldassare Castiglione, a brilliant character study. During his time in Rome, Raphael also performed architectural work, simultaneously designing the church of Sant Eligio degli Orefici, whilst completing the Stanza della Segnatura. In 1514, Leo X chose Raphael to work on the basilica of St. Peter's alongside Bramante. Renowned as an avid student of ancient Greco-Roman sculpture he was appointed commissioner of antiquities for the city in 1517, and virtually controlled all of the papacy's various artistic projects in Rome. Raphael's last masterpiece The Transfiguration (an enormous altarpiece) was left unfinished at his death and completed by his assistant Giulio Romano. Dying on his 37th birthday from a fever, Raphael's funeral mass was celebrated at the Vatican, where The Transfiguration was placed at the head of the bier, and his body was buried in the Pantheon in Rome.